Can I run my air conditioner all year long? Is it normal for my unit to run continuously? Do window air conditioners affect a room's humidity level? How can I improve the efficiency of my window air conditioner? The window air conditioner offers an efficient, convenient means to cool a room or two in your home. Properly maintaining your air conditioner will improve efficiency, reduce energy consumption and prevent costly repairs and downtime. Before performing any maintenance or repair work, be sure to review your air conditioner's owner's manual for instructions. On most models, the air filter is easily accessible by removing the front panel. Remove the filter and clean it gently with a combination of warm water and dish soap or white vinegar. Let the filter air dry completely before reinstalling it. These should be cleaned once per month during the cooling season. If you have pets or allergies, consider cleaning it more frequently. If the filter has tears, holes or other damage, it should be replaced. If your unit has a foam filter, you can purchase replacement electrostatic filter material and cut it to accommodate the exact size of your model. If you've left your air conditioner uncovered in your window or wall over the winter, you'll need to check for wasp and bees' nests inside of the unit. Avoid problems with this in the future by storing your window air conditioner in a protected area such as a basement or utility room during the off season. If you must leave your AC in the window, use an air conditioner cover. Over time, dust and dirt will build up on the inside of the air conditioner's condenser coils. This build up will require your AC to work harder to remove heat – increasing energy consumption and your monthly electric bill. At the start of every cooling season, clean the condenser coils. You'll need to remove the air conditioner cabinet completely in order to access the coils. They can be cleaned by blowing compressed air at them or by using a soft bristle brush and a spray bottle of household cleaner to wipe the dirt off. Take great care in removing the dirt. If you accidentally bend or dent the aluminum coil fins, use a handy fin comb to straighten out the fins. It is also important to remove dirt or lint build up at the bottom of the air conditioner so the condensate water will be picked up by the condensing fan blade slinger properly. To prevent the growth of mold and a musty odor in the air, use warm water, dish detergent or white vinegar to clean the inside base of the unit whenever you have the unit taken apart to clean the condenser coils. If the temperature outside the room where the air conditioner is placed becomes cool (approximately 60 degrees Fahrenheit or 15 degrees Celsius or lower), check the coils on the front of the air conditioner for icing. Ice buildup on coils means the temperature is too low for proper operation of the unit. You should use it only when the outdoor temperature rises above 60 degrees Fahrenheit or 15 degrees Celsius. You may need to replace the batteries in your unit's remote control. If you replace the batteries and the remote control fails to function, enter your unit's model number to find a replacement remote control. Leaving window air conditioners in windows during the winter can cause drafts and lead to increased energy consumption. Air conditioners are best stored in an attic, basement or utility room. Garages are not a wise place because small animals and insects are more likely to seek shelter inside of AC units in those locations. Mice and other rodents are known to chew on wiring and cause expensive damage. If you must keep the unit mounted in the window during the off season, be sure to use an air conditioner cover that's specifically designed to protect AC units from weather damage. Window air conditioners work on exactly the same principles as a refrigerator or dehumidifier. They have a cooling system that refrigerates the air entering the unit and then expels the heat from the back of the air conditioner. If you're in the market for a new air conditioner, make sure you purchase the correct size for your home's needs. 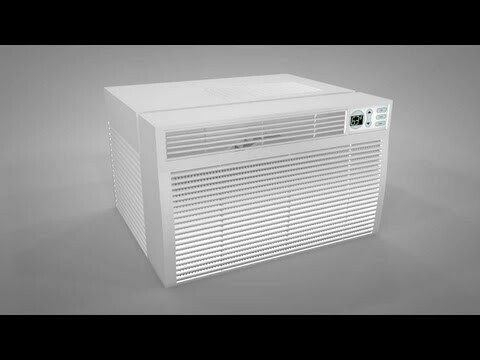 An undersized air conditioner will have to work harder, waste energy and cost you more money. Conversely, an oversized unit will cycle too quickly and may not run long enough to remove humidity in the air. A little homework will go a long way in ensuring you find the right size air conditioner to maximum efficiency and save money. Check the power available near the window. Most larger air conditioners require a dedicated circuit and some require a 220 volt circuit. If you have high ceilings or multiple windows in your space, you'll need to increase required Btus slightly. If your space is highly shaded, you can reduce the required Btus by 10 percent. If there is abundant sunshine in your space, increase the required Btus by 10 percent. If the space includes a kitchen, add 4,000 Btus. Due to cooking, kitchens generate more heat than other rooms. Add 600 Btus per person who regularly spends time in the room or space. Here are the recommend sizes listed by square footage of the area to be cooled. All figures are based on a room with a ceiling height of eight feet. The moisture in the air condenses on the refrigerated coils and drips into the bottom pan of the air conditioner where it is picked up by the condenser fan blade and used to help cool the condenser coils. The heat which is removed from the home through the evaporator coils is conducted into a refrigerant gas and then travels through a radiator-like set of coils on the back of the unit. The condenser fan circulates outside air across the coils to cool them. You can run the air conditioner as often as you need, if both the outside and inside temperatures are above 60 degrees Fahrenheit (15 degrees Celsius). If the inside or outdoor temperature is below 60 degrees Fahrenheit (15 degrees Celsius), the unit may not function properly. Yes, window air conditioners use a considerable amount of energy. A standard, single-room air conditioner will cost approximately seven to 12 cents per hour to operate. If you run the air conditioner for eight hours per day, it will cost you approximately $24.40 per month at $.10 per kilowatt hour. Use a thermometer to check the temperature of the air in the room. Check the temperature of the air blowing out of the unit. The difference between these temperatures should be at least 15 degrees. If the difference is fewer than 15 degrees, the unit is likely malfunctioning and you'll need to troubleshoot further. If the temperature difference is at least 15 degrees and yet the room is still not cooling enough, check to be sure the unit has enough Btus for the space to be cooled. Yes, window air conditioners remove humidity in the air. The evaporator coils located in the front of the air conditioner grow cold during normal operation. As the warm, moist air in the room comes in contact with the cold evaporator, the air's moisture condenses and attaches to the evaporator coil. As more moisture condenses, moisture on the coil drips into the base of the air conditioner where it is evaporated to the outside of the home. RepairClinic.com has replacement parts and accessories for window air conditioners including air filters, covers, remote controls, knobs, touch-up paint, side curtains with frames and many other products. Enter your air conditioner model number to find the parts for your model.